Severstal Auto, Russian producer of UAZ off-roaders and local partner of Ssangyong and Fiat decided to change its name. 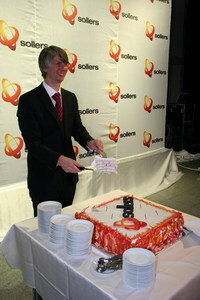 The new brand name will be Sollers. Severstal Auto was born in 2000 when steel giant, Severstal took control of the UAZ automobile factory in Ulyanovsk and the ZMZ engine factory in Zhavolzhe. In 2005 Severstal Auto made a deal with Ssangyong, a South Korean maker of SUVs on local assembly. It was followed by a similar deal with Fiat in 2006. In order to cater for CKD assembly of Ssangyong and Fiat models, Severstal Auto took over ZMA (Small Car Factory) in Naberezhnye Chelny in 2006. Today it assembles various Ssangyong and Fiat products. A new Severstal Auto-Fiat facility was opened in Elabuga earlier this year, where the Ducato LCV will be produced. In early 2007 Severstal sold Severstal Auto to Vadim Shvetsov, CEO of Severstal Auto for an undisclosed sum. With the new brand name, the company will open a new chapter in its history. 'Sollers is the Latin for clever, skilful, and this is an appropriate name for our services-focused company,' Shvetsov said. The first Sollers dealership will open on April 25, although shareholders will not officially endorse the name change until the annual general meeting (AGM) on May 30.